It happened more than 1.4 million times during August 2011 – Facebook users clicked on a link to a newspaper obituary or guest book. That number climbed to 2.1 million in November, and it looks to exceed 2.5 million this month. We know this because the traffic is being generated on newspaper websites affiliated with Legacy.com. To borrow a phrase from Buffalo Springfield, “There’s something happening here.” We at Legacy.com believe it is a good thing, and we know it’s not happening by accident. I want to explain why it’s good, why it’s happening, and why we at Legacy.com believe we are in the early innings of the phenomenon. Obituaries help drive overall newspaper readership. They typically originate in print, where they comprise one of the most read sections of any newspaper. But they also go online, where they “come to life” – with guest books containing memories shared by others; with directions to funeral services; and with links to help users donate to charity, order sympathy flowers, or offer condolences in other ways. In doing so, the online obituary becomes a highly visible reminder to everyone that their local newspaper is where such content originates. A virtuous cycle is created, with print obituaries promoting online obituaries and online obituaries in turn promoting the newspaper as the publisher of record in print. When new users from Facebook, many of whom may not have otherwise visited the newspaper website, find the online obituary, it helps fuel this cycle. And users who click to a newspaper obituary from Facebook are more “social” once they get there – for example, they are 20% more likely to sign a guest book than a typical newspaper website visitor. When this happens, everyone is better off – Facebook furthers its goal of helping people connect and share, newspapers broaden their audience and deepen existing relationships, and the average user experience is enriched. A funeral industry friend of mine once said: “Death is the most viral of all life events”. Think about it; on what occasion does news travel faster? One of the places such news now gets distributed is Facebook. At Legacy.com we observed this and said: If newspapers are the great storytellers of our time, including life stories in the form of obituaries, and if Facebook is where many people share the news of someone’s passing, then let’s make sure Facebook users have access to newspaper obituaries and guest books as part of the memorializing that takes place there. We have helped make this possible in an expanding number of ways, but four have been instrumental. By simply adding the ability to “Share” a newspaper obituary on Facebook, we’ve allowed people to post links on their Facebook wall directing friends back to the newspaper obituary and guest book. These users can view the newspaper obituary placed by the family and leave their memories in the online guest book associated with the obituary. With all obituaries and guest books now integrated with Facebook’s Open Graph API, users can share guest book entries created in newspaper guest books with their Facebook friends in “real time.” After a guest book entry is written on a newspaper site, the user has the option to post a link to the guest book on their Facebook wall. When users share this information on Facebook, their friends are able to see the vitality of the newspaper’s online obituary page, and they may be inspired to sign the guest book as well. Another way we’re raising newspaper obituary awareness to Facebook users is by displaying the “Most Shared” obituaries and guest books, as well as Facebook “Friends’ Activity,” on newspaper websites. Again through Facebook’s Social Graph API, obituaries and guest books that are most popular to Facebook users and friends can be listed for other users to view and interact with. 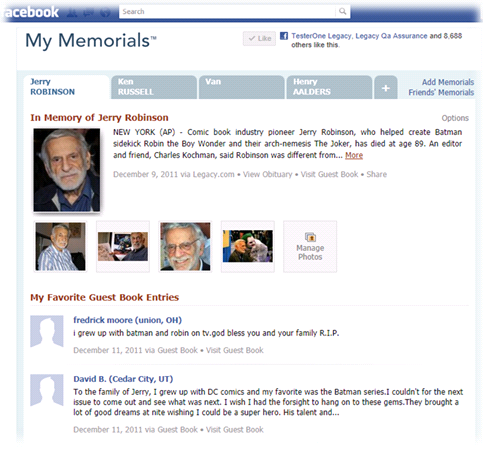 With Legacy.com’s My Memorials™ Facebook app, Facebook users now have a personal place to memorialize friends and loved ones. My Memorials™ directly links Facebook users to newspaper obituaries and guest books that are important to them. Users also have the ability to enhance the obituaries they are following on My Memorials™ by adding photos and creating a list of their favorite guest book entries. We at Legacy.com believe that almost every person alive today has someone important to them who is no longer alive. We believe that one day each person’s Facebook page will include memorials of people important to them. We are just getting started on the various ways we hope to bring our affiliates’ content to the attention of Facebook users and encourage them to engage with it. In doing so, we believe that publishers can benefit from more and deeper connections with the Facebook community as well as their local community. This entry was posted in Ask the CEO and tagged CEO, Facebook, Newspapers, Obituaries, Social media, Stopher Bartol. Bookmark the permalink.